So far so good with the simple valve amplifiers. All the models so far are single ended designs, in which one single valve powers the output transformer, but most guitar amplifiers are push-pull designs, where a pair of valves ( or more ) drive the transformer. This type of design is more complex and involves splitting the signal into positive and negative halves of the wave form ( phase-splitter ), amplifying both halves separately and then recombining by using them to drive an output transformer with 2 equal windings. This comes with a new set of problems and possible distortions. Firstly phase-splitters are rarely perfectly symmetrical, second perfectly matched output valves are again unlikely and third the coils of the transformer never perfectly match. In addition the process of combining the output valves through the transformer effectively cancels EVEN HARMONICS, thus the distortion added at the output stage is predominately ODD HARMONIC. 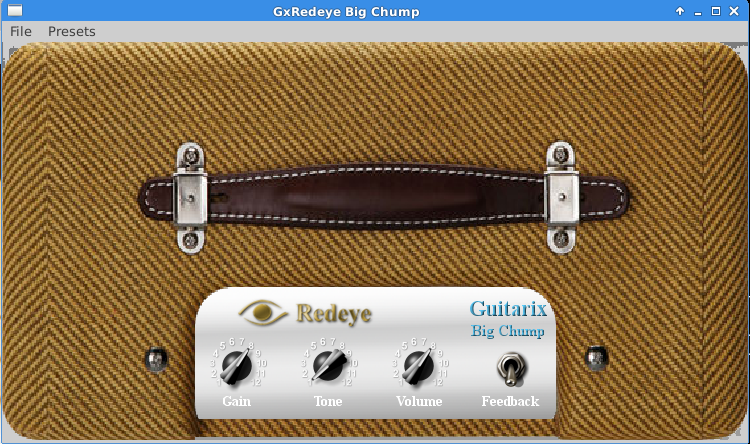 Bang goes the myth that guitar amp distortion is liked because to is EVEN HARMONICS! Phase-splitting fairly trivial in digital domain and option to subtly alter the signal path of the positive/negative halves means we can intentionally introduce some distortion here. Same with power valves simple to alter parameters to ensure they are not perfectly symmetrical. Transform again a very simple model and trivial to slightly alter one so that the "coils" are not perfectly matched. So put it all together and what happens? It does work and sounds quite different from The Chump, maybe needs some more detailed experiments with the imbalance of the channels as in theory could introduce a switch or pot that varied the imbalance from none to extreme. For this amp decided to use 2x12 as the bigger push-pull amps tend to have larger speakers, could also possibly sound good with a 1x12. As The Chump sounded so good decided to insert the tremelo circuit into the amp to clone Fenders later VibroChamp model, and again seems to work pretty well. Having been pleased with the results so far it was time to try and build a complete guitar amplifier. To keep it as simple as possible the design is again loosely based on the Fender Champ, very simple in design, 2 stages of preamp valves and one power valve. The valve models already exist in the Guitarix code but no attempt had been made to model the effects of output transformers or NFB ( Negative Feedback ) so I decided to try to add something to the circuit to include these. NFB had already been tried in an earlier experiment and only changes here were to make it switchable with the hope of giving the amp a wider range of tones. After some research it seems simulating an output transformer is really not trivial and so I settled on a very simple model of highpass and lowpass filter until I can get a more sophisticated model. 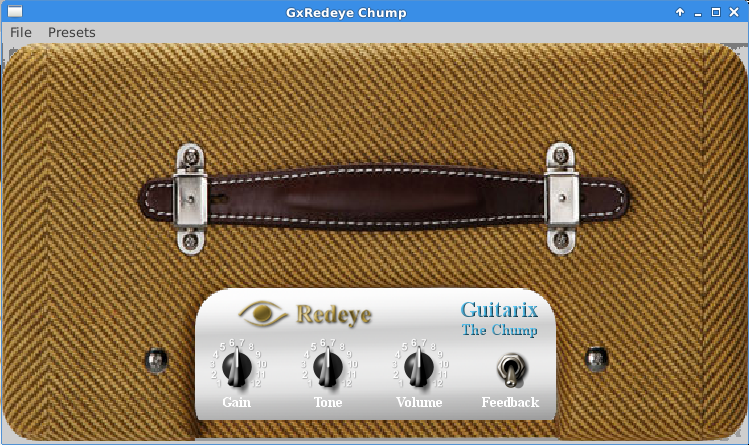 After some playing with parameters results started to sound pretty good, very much a clean and slight crunch amp. Feedback thins sound slightly and alters the flavour of the distortion so a useful feature but need to work on eliminating the squealing at higher volumes. In respect to the original I called this "The Chump"! Next a preamp based on the legendary F2-B studio preamp from Alembic. is used in many studios for direct injected bass in particular. The circuit is almost exactly same as that used in many tweed Fender amplifiers. Additional bright switch around volume control. Results very good. All works as original circuit but at present I only have a similar circuit to compare with so unsure how much like original it sounds. From circuit diagrams it seems original had only 150V power rail whereas I have used 250V for the models. May well revisit and try with lower voltage, in theory should give more distortion.